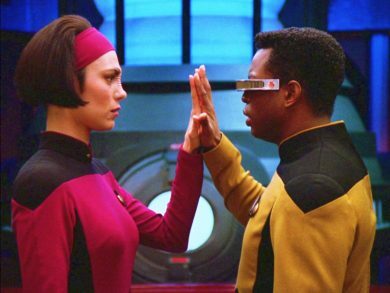 When Ensign Ro and Geordi LaForge are beamed back from a damaged Romulan ship, a transporter accident leaves them missing and presumed dead. The rest of the crew are organizing a memorial service, but Ro and Geordi are trapped out of phase and desperate to get back among the living. They may need a lot more memorials, though. The Romulans are planning to blow up the Enterprise! New wave, dance craze, anyways, “The Next Phase” is next on Mission Log.